Mie University | International Internship students from Catholic University of Applied Sciences Freiburg paid a courtesy call to President Komada. International Internship students from Catholic University of Applied Sciences Freiburg paid a courtesy call to President Komada. 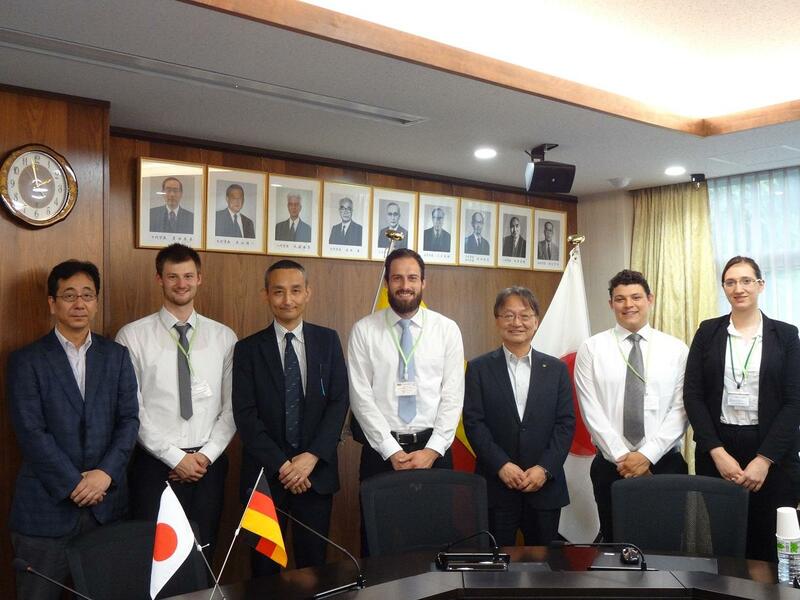 On June 16th, Students who came from Catholic University of Applied Sciences Freiburg as International Internship paid a courtesy call to President Komada. Vice president Hiroki Hori and Prof. Yugo Narita also attended the meeting. They work as a nurse or a medical assistant in Germany. And they are going to work as an intern for Kinan Hospital, Mie Prefectural Shima Hospital, Kuwana City Medical Center and National Mie Hospital during their stay. Then they talked about difference of education system between Germany and Japan and we realized there is fulfilling support system for student in Germany. Mie University has cooperated and had active mutual teacher and student exchanges with Catholic University of Applied Sciences Freiburg since 2011. It was precious opportunity for students and Mie University. We hope that cooperation between two universities will be deepened further.